My world is upside down. Right when I am hearing mixed reviews about the current state of Wink (one of my long standing favorites), I happen into Jeffery’s. To be honest, I had left this place for dead quite a few years ago. But, like a flambeed Phoenix rising from the ashes, Jeffrey’s is back on my radar. Under the stewardship of Chef Deegan McClung (Commander’s Palace and Herbsaint in New Orleans, Uchi, Wink) the menu has undergone a complete overhaul. The new offerings are fresh and current. 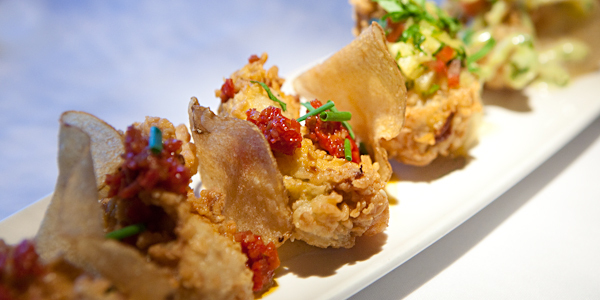 Even the iconic Cripsy Oysters ($15) have gone through a transformation. 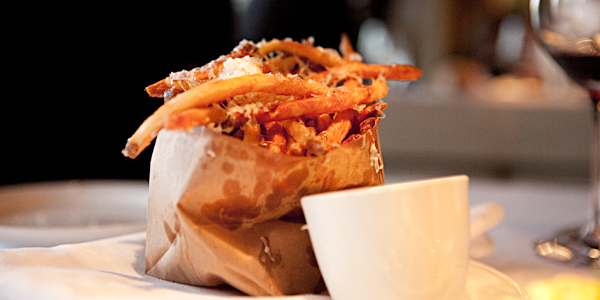 Plump and juicy with a rich, tomato, bacon sauce and house fried potato chips. The old version has been on the menu longer than Matthew McConaughey has been climbing the moon towers. If you are under 30 and are wondering what they tasted like, don’t worry. They are one of two surviving items on the menu. Order the combo plate (pictured above) to witness history in motion. “We started with 200 new ideas for the menu and narrowed it down”, Deegan says, “the only thing we couldn’t change was the Fried Oysters and the Valrhona Chocolate Intemperance.” Re-writing a menu is a prerequisite to change. But, they went farther than that. They attacked the structure, too. The ancient carpet has been replaced with stone inlay tile and the drab brown walls are now white. The space feels bright and inviting. 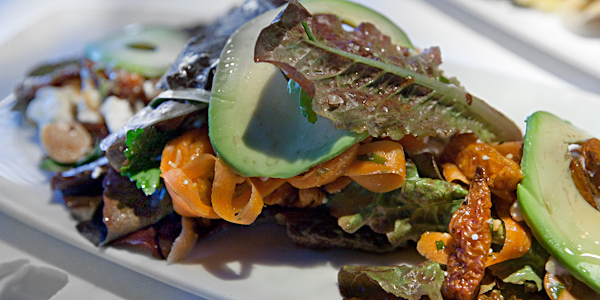 Thumbalina Salad ($12) is an eye-opener. The balance of ingredients (carrots, avocado, romaine, almonds, Feta and dill) come together stronger than the sum of their parts. It’s one of the more memorable salads I have had in town in quite some time. The rich Pork Belly Steam Buns were great. 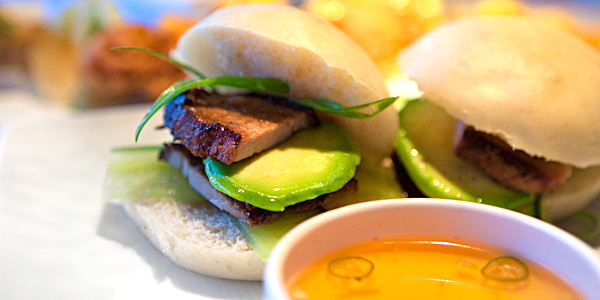 Slow-roasted pork, cucumber, and avocado with a Citrus-Nuoc Mam sauce ($12, the buns are made in house daily). The pork still had some chew to it. 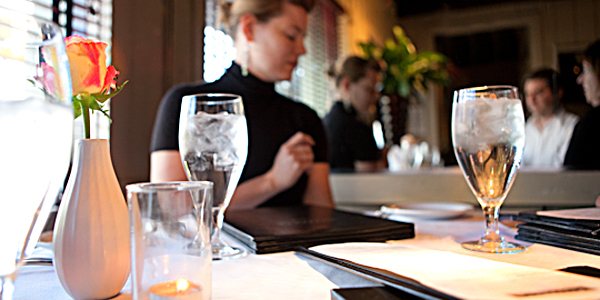 In a town that is overflowing with braised meats, it might catch some eaters off guard. I’m talking a lot about the starters, but they are the ones that caught my attention (and budget during happy hour). Even the fries were great. The menu is still evolving. I’m eager to try the new Tile Fish and Spring Rabbit items that start this week. Deegan’s food is smart and relevant. I can’t believe I’m saying it, but Jeffrey’s is one of my new favorite restaurants. It was quite tasty! The oysters and salad were my favorites. It’s been many years since I’ve visited Jeffrey’s. I see that I need to go back! Everything looks delicious. Were those buns really steamed? They look baked in the photo. Just received word from Jeffrey’s. The buns are steamed, and made in house by our their pastry chef daily. Okay now I really need to try Jeffrey’s it’s been on our todo list for quite some time but that salad description is pulling me in. Thanks again for a winning review and your pics are always eye pleasing. mmm can’t wait to go back to Jeffrey’s!